The use of non-traditional children's colors is what makes the SoftTiles Safari Animals play mat in Orange, Brown, Lime, and White so unique. It's great for kids, but it's a mat that you'll be proud to show off in your living room. The Safari Animals in this play mat are very large. They are die-cut from our large SoftTiles 2 foot x 2 foot interlocking foam tiles. This play mat measures 6.5 x 6.5 feet (78 x 78 inches)- an area over 42 sqft. This is a nice sized play area for infants learning to crawl and toddlers starting to walk. You'll enjoy the mat too, especially if you're on your hands and knees playing with your child. 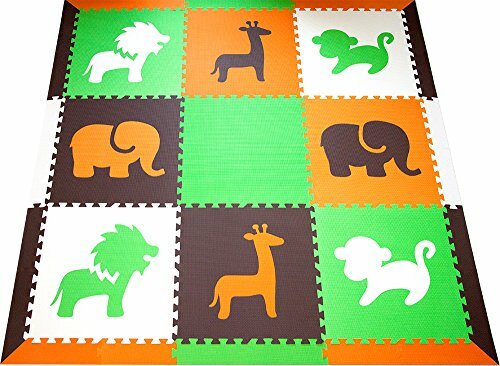 In this foam tile set, you will receive 8 Safari Animals (2 Elephant, 2 Giraffe, 2 Monkey, 2 Lions), 24 sloped border pieces in Orange, Brown, Lime, and White. The sloped borders are unique to SoftTiles and help provide a smooth transition from the mat to the floor. It helps prevent tripping and looks great at the same time. This set does not contain small pieces! SoftTiles are made in Taiwan from EVA foam and tested free of formamides, BPA, phthalates. Because the Safari Animals foam mats are die-cut, we do not recommend them for use on soft surfaces like carpet as the pieces can pop up when walked on. SoftTiles has been creating designer foam mats for kids since 1994. We saw the need for great designs and fun colors. If you want a distinctive play mat for your child's playroom, then this mat is for you! Designer: Delight your child and wow your friends with this uniquely designed playroom floor. These playmat sets lay the foundation of a modern fun playspace filled with lovable Safari animals artfully designed and available in a variety of color palettes. SOFT: SoftTiles easily transform hardwood floors and concrete basements into fun soft playrooms. Simply interlock the pieces to create soft cushioned surfaces that are perfect for infants and toddlers crawling and learning to walk. Great surface for older children too. Parents and grandparents getting on the ground to play with the kids will appreciate the softness too. HIGH QUALITY: SoftTiles are made of a dense durable foam that is 5/8" thick (14mm). Thicker and superior in quality to mats you will find in the mass market, SoftTiles hold together well and are less likely to come apart. SoftTiles are designed from the outset to both look great and last. SLOPED BORDERS: SoftTiles sets are beautifully finished with specially designed sloped borders that prevent tripping when entering and exiting the play mat.